Tristan Anderson’s civil trial against the Israeli Military will begin on Sunday 7 December at 10:00, Jerusalem District Court. 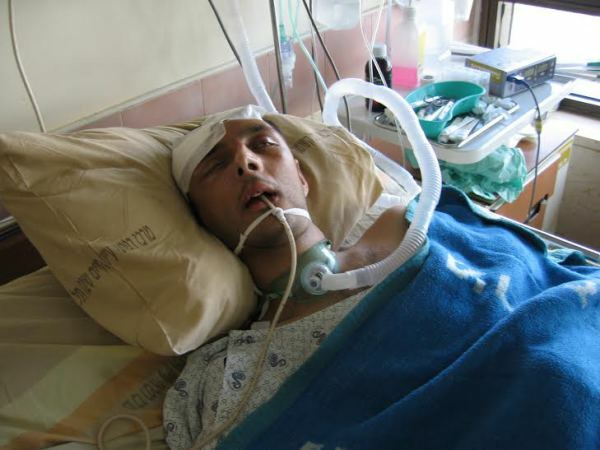 Tristan Anderson was critically injured after being shot in the head with a high velocity tear gas grenade by Israeli Border Police following a protest against the construction of the “Separation Wall” in March of 2009 in the West Bank village of Ni’ilin. Anderson, an international solidarity activist from Oakland, California, had arrived in the region a few weeks earlier with his American Jewish girlfriend who also attended demonstrations opposing the seizure of Palestinian land and freedoms for the building of the Wall. 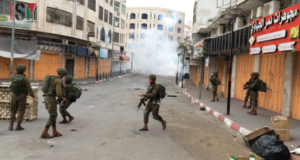 According to its manufacturer, Combined Systems Inc (of the USA), High Velocity Tear Gas grenades are intended as “barricade penetrators” and have a range of several hundred meters. Tristan was shot in the face from about 60 meters away, crushing his skull, blinding him in one of his eyes, and sending shards of bone penetrating deep into his brain. Years later Tristan continues to require around the clock care because of cognitive impairment and physical disability. He is also paralyzed on half his body and uses a wheelchair. 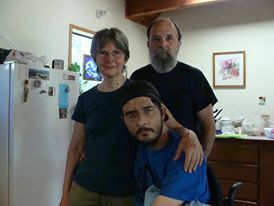 Tristan with his parents, Mike and Nancy Anderson in their home in Grass Valley, California. No criminal charges were ever filed against the officers who shot Tristan Anderson and the investigation into his shooting has been widely regarded as a sham. The family of Tristan Anderson, represented by Israeli human rights attorney Lea Tsemel, have been waiting for years for their day in court. On the witness stand this week (Sunday 7 Dec and Thurs 11 December) will be other international activists who were with Tristan at the time of his shooting. 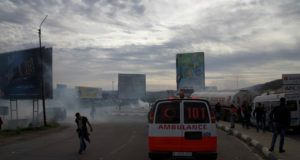 They will give testimony about the shooting itself, their involvement in the protest movement, and about the checkpoint where Tristan’s ambulance was delayed by Israeli soldiers. 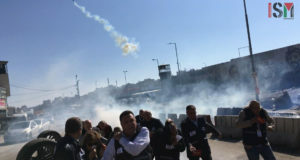 Several Palestinian activists also witnessed the shooting, but have been banned from participating in the trial because they are West Bank residents and the court is in Jerusalem. Additional court dates (in addition to 7 Dec and 11 Dec) are set for 25 December, 28 December, and 4 January. Ni’lin continues to hold weekly demonstrations against the Wall.